Mash the avocado flesh. Mix in everything else! Eat immediately. If you store this in the fridge it will keep for another day, and the flavors will intensify, however the beautiful green colour will darken and slightly brown. *Pet Peeve. My spell check is american apparently. It keeps telling me colour isn’t spelt with a U. Gah. * I like to eat my guac. with 100% corn chips, mixed with some fresh pico de gallo. **NOTE*** If any of you fellow wordpress users could assist me, it would be greatly appreciate it. Despite categorizing my recipes as ‘recipes’, they don’t seem to show up on my recipe page! HELP! 3. Bake balanced on edges of a pan (so the fat drips onto the pan, and the chicken isn’t touching the pan) at 410 C for 40 minutes. 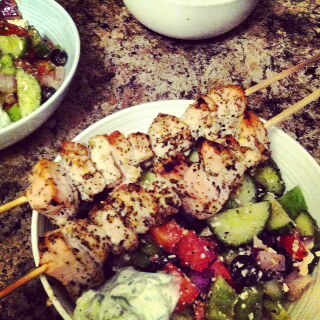 Makes 2 large servings, or 4 side salads. Mix all ingredients in large bowl. Set aside to marinate aprox. 15 minutes. Serve. Mix in a bowl. Let sit 2-3 hours or overnight. Makes 1L mason jar’s worth. 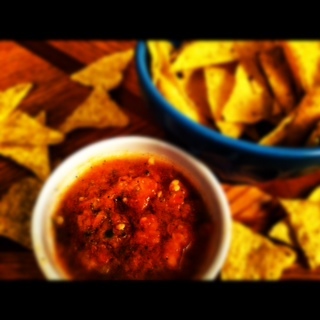 Inspired by the fantastic fresh salsa we ate at Amigo’s Cantina! If you like a smoother salsa, puree ingredients from hardest to softest, adding spices at the end. 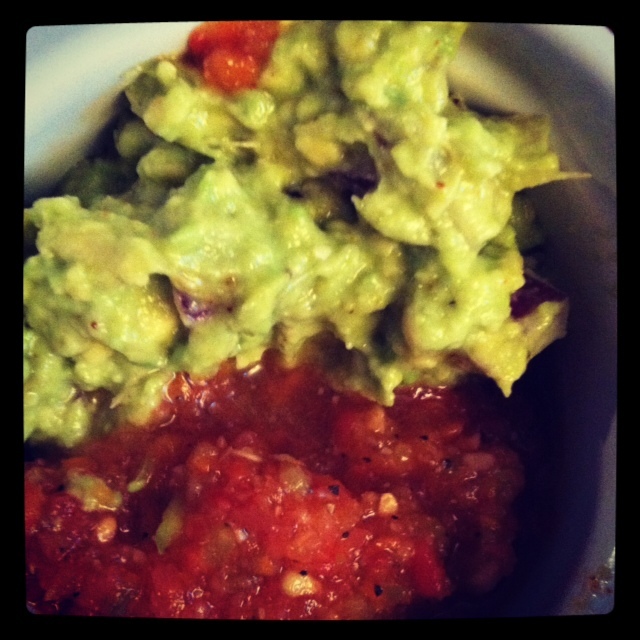 If you like a chunkier salsa, finely chop all vegetables, leaving one tomato to puree with spices. Mix vegetables and tomato puree. 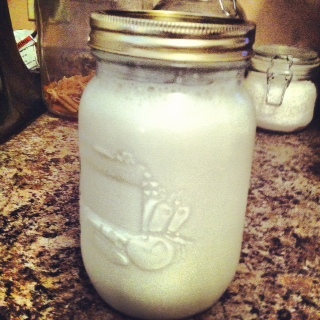 Store in mason jar in fridge for up to one week. Started off this sunny saturday by cozy-ing up in my new knit wool infinity scarf I picked up while out shopping with the hubbie yesterday. Bought it at GAP for $49.99. Expensive for a scarf, but I felt for the quality and warmth, it was worth it. I absolutely adore it. Also cracked open a new MAC studio fix pressed powder and concealer (I have been wearing tinted moisturizer lately and it was killing my skin!) and a little 12$ perfume I picked up at Aeropostal. Smells like a mix of cotton candy and spring. De-light-ful! As someone who dosen’t drink, I was super excited. Most alcohol-free wines still have about 0.5% alcohol, so I have never partook. This one is pretty much fancy grape juice. I thought we would give it at try. I think it is great. I looked it up online. “For over 25 years, MADD Canada (Mothers Against Drunk Driving) has successfully educated the public to the perils of drinking and driving. Not only have they changed the way most of us view drinking and driving, in doing so, they have saved thousands of lives. However, MADD Canada’s work needs to continue, and that was the inspiration for MADD Virgin Drinks. 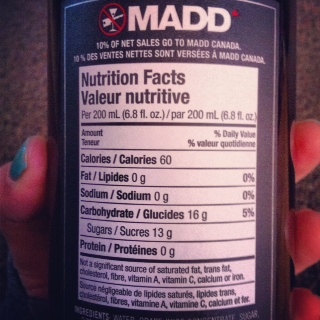 MADD Virgin Drinks were conceived to support the work of MADD Canada, both philosophically and financially. In fact, MADD Virgin Drinks proudly contributes 10% of net sales to MADD Canada in support of their ongoing efforts to reduce the incidence of impaired driving, and support the victims of this completely preventable crime. We hope you’ll join us in supporting the efforts of MADD Canada. So if you don’t drink, like myself. Or you are pregnant, trying to be pregnant, or the designated driver, check it out! Support this awesome cause!! Combine everything in the mason jar, seal. Shake your little heart out until the condensed milk is no longer clumped on the bottom! Its just that easy! Have a great day! Don’t forget to check out MADD’s great new line. Available at Sobey’s in Saskatoon! Quick and easy. A favorite to make for leftovers when working shift-work, or for lazy Saturdays! 1. Preheat oven to 400 F. Wisk spices, eggs, milk and cheese in a large bowl. 2. Let sit, covered, in fridge while cooking bacon to a crisp in a pan: aprox. 10 minutes on med-high heat. 4. In a pie plate, roll out pie pastry. 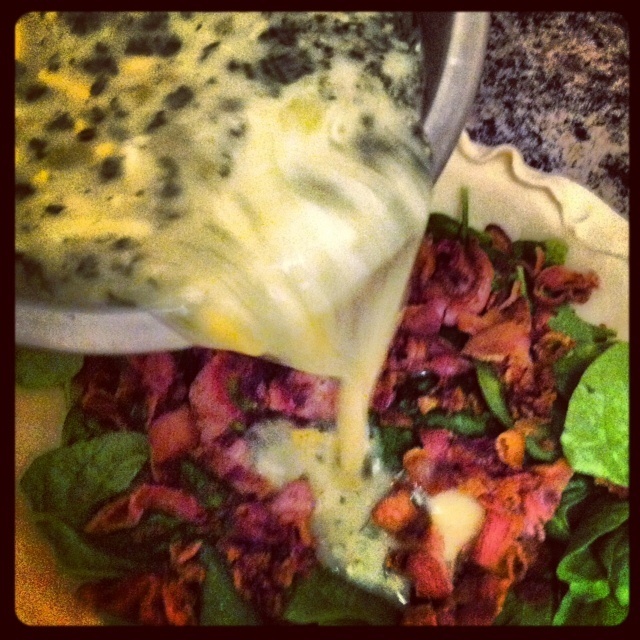 Cover bottom of pastry with spinach and bacon. 5. Pour egg mixture over spinach and bacon. 6. Bake for 45 minutes. Reduce heat to 200 F after 20 minutes- at this point your quiche should appear cooked, but jiggle in the middle when disturbed. If you don’t reduce heat, the outter eggs will be over cooked by the time the middle eggs are set. 7. Allow to cool 10-15 minutes, slice and serve warm. *Can be frozen 1-2 months. 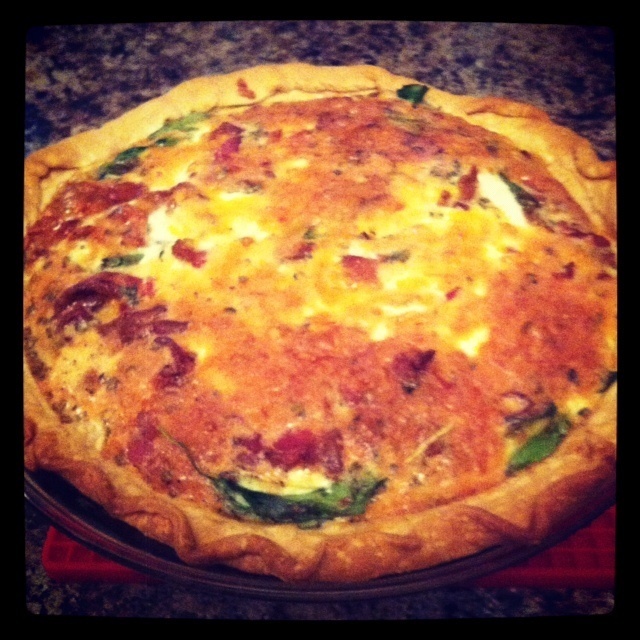 **To reheat in microwave, place half a cup of water beside plate of quiche to help retain moisture.